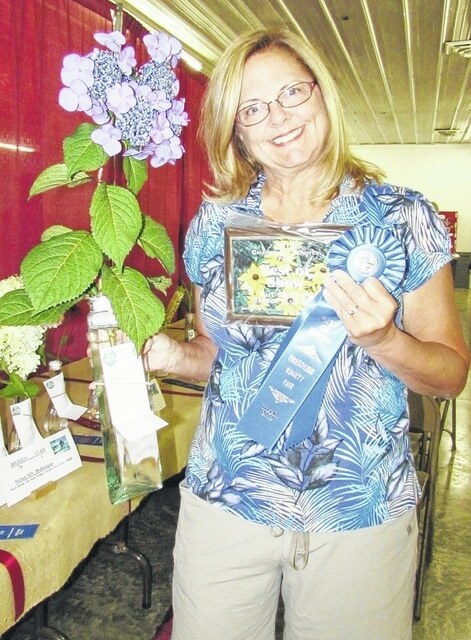 The 2015 Champaign County Fair Best Cut Specimen winner is Jill Michael of Urbana with a hydrangea. The 2015 Champaign County Fair Garden Club junior division Best Horticulture award went to Sammie Shoemaker (not pictured) with a daisy. 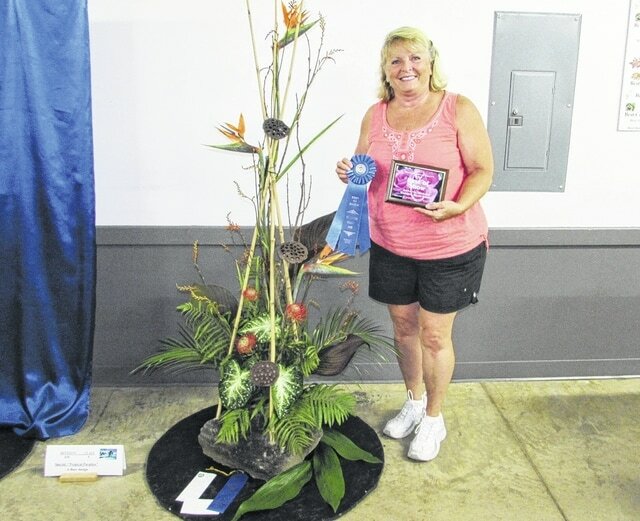 The 2015 Champaign County Fair Garden Club Best of Show in Artistic Design winner is Sherrie Boutell of Urbana. 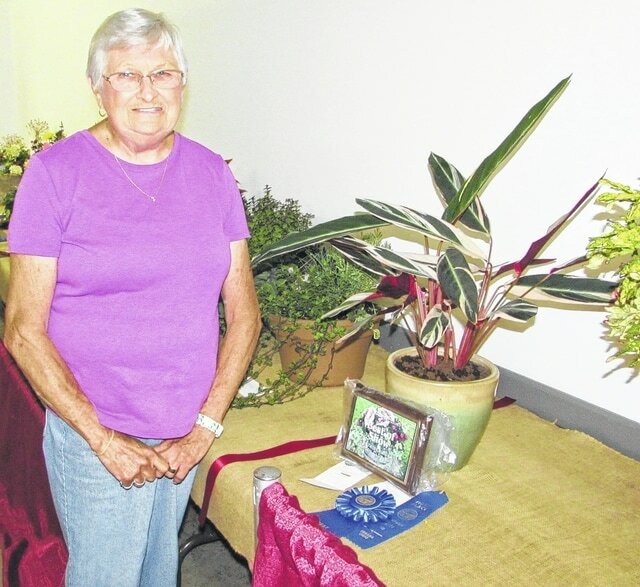 The 2015 Champaign County Fair Garden Club Best Container winner is Jean Boysel of Urbana with an aglaonema, or Chinese evergreen. The 2015 Champaign County Fair Garden Club Queen of Roses winner is Susan Dorsey with her “firefighter” rose. The 2015 Champaign County Fair Garden Club Junior division Best Artistic Design award went to Melissa Graham. She is not pictured. Green thumbs looking for ideas on their own garden didn’t have to look far at this year’s Champaign County Fair. The annual Champaign County Federation of Garden Club show Saturday displayed a variety of flowers and arrangements with a tropical theme. This year’s winners ranged from a nearly six foot tall Hawaiian-themed arrangement to a muted blue hydrangea. Best of Show in Artistic Design winner is Sherrie Boutell of Urbana. Boutell got the idea for her floor design arrangement from the Hawaiian islands. She chose a lava rock from the landscaping at home and arranged the flowers around and in it. “I just let it all come together,” she said. This year’s Queen of Roses, Susan Dorsey of Mechanicsburg, is also a past winner, though in different categories. 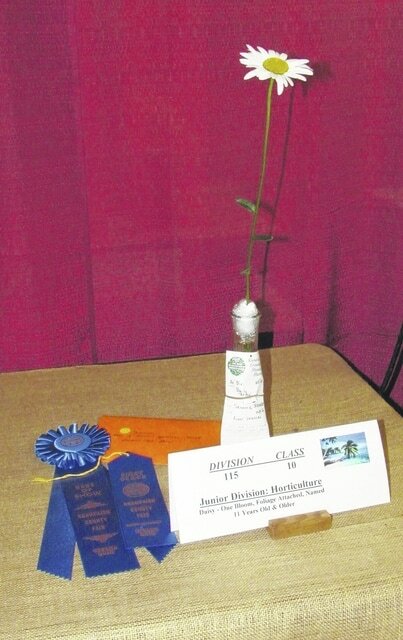 Her “firefighter” rose – so named in honor of the firefighters who died on Sept. 11, 2001, took top honors. 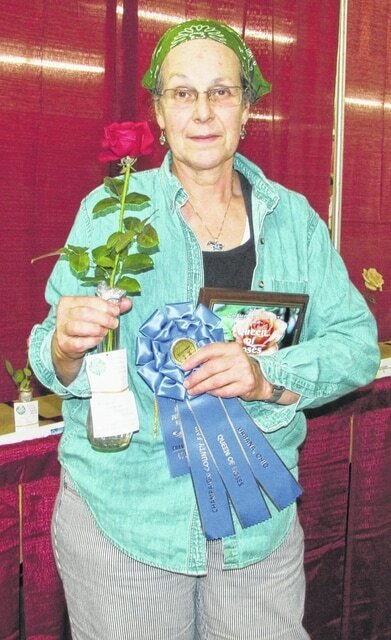 “This is a new rose for me,” she said, adding that she won with a lily last year as Best Cut Specimen. She said the best way to ensure good roses is to water them often. The Best Container Plant winner this year came from Jean Boysel of Urbana. The aglaonema – best known as a Chinese evergreen – was just “so pretty,” she said, which was why she decided to go with that as her entry this year. Boysel, who has won awards before, but not this specific award, encouraged patience in gardening. This year’s Best Cut Specimen was a blue hydrangea, cultivated by Jill Michael of Urbana. Michael is no stranger to the category – she has won the Best Cut Specimen award in the past. The best way to determine which flower to enter in a person’s own garden is to just look at them individually, and see which looks the freshest. Michael said she would like to see more people out there gardening. “Gardening is beautiful, and it is good for your soul,” she said. 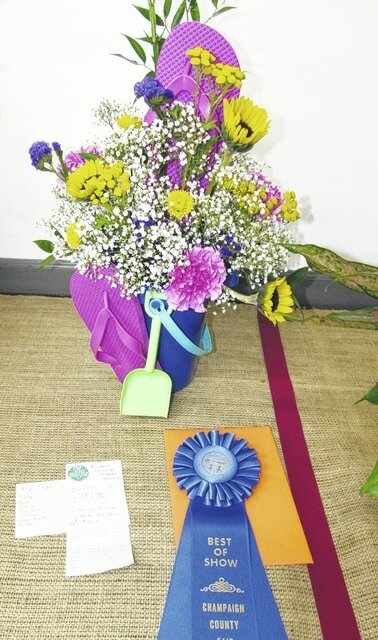 The winners of the garden clubs’ Best Junior Horticulture award was Sammie Shoemaker, with a daisy. The Best Junior Artistic Design award went to Melissa Graham, age 6, with an arrangement featuring flip flops, a bucket and sand scoop.